Reviewing the uptime of our services is something we do on a regular basis here at OnYourMark to ensure that our services are top-notch and performing as expected for clients that depend on them. Here is one example of the reward for the effort we put into keeping the services our clients depend on available. 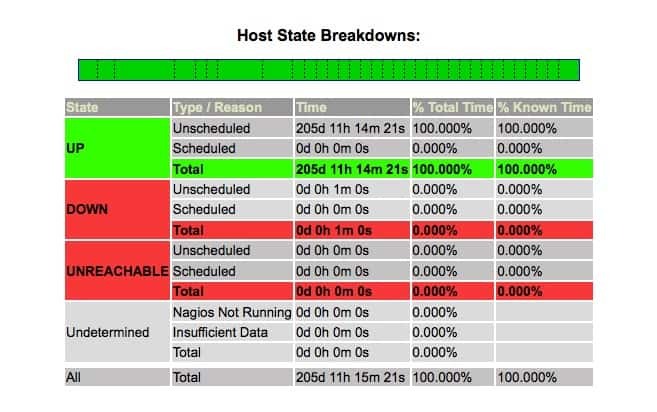 This is a graph from the server monitoring software we use to notify us of any potential problems and over the last six months, we have had zero downtime on that server. But what is more important is to ensure that not only the server is up but the services that server provides are up, in this case it is a mail server providing POP3 and IMAP4 services. In the last six months we have achieved almost 99.999% uptime. That means less then five minutes of downtime in a year which translates to less then 26 seconds of downtime a month! The reason there is any downtime is simple; updates need to be performed to keep the services up-to-date and secure and as such the service needs to be restarted. We work hard at OnYourMark to ensure that the design, production, programming, hosting, and internet marketing tools we provide are always available. Contact us today to get more information on how we can help you reach a worldwide market at http://onyourmark.com/contact-us/ or call us toll-free at 1-800-747-3399.